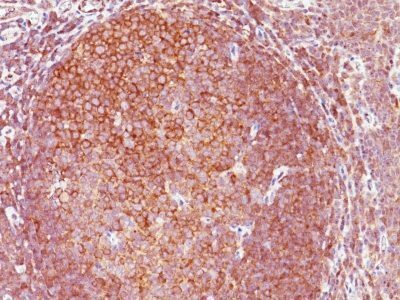 This antibody recognizes a protein of 54 kDa, which is identified as cyclin A. This antibody recognizes a protein of 54 kDa, which is identified as cyclin A. Its epitope is located in amino acids 144-148 of human Cyclin A2. Cyclins are regulatory subunits of the cyclin-dependent kinases (cdk’s) and they control transition at different specific phases of the cell cycle. The temporal expression of cyclins is tightly regulated and subsequently plays a critical role in controlling the enzymatic activity of cdk’s. These cyclin/cdk complexes are essential for passage through specific stages in the cell cycle. In mammalian somatic cells, cyclin A is required for S-phase and passage through G2-phase. The D and E type cyclins regulate the passage of G1, while cyclin B is a critical regulator of mitosis. Mutation or disruption of normal cyclin A expression causes cells to arrest in G2-phase. Catalog number key for antibody number 0673, Anti-Cyclin A2 (E67) The prefix indicates conjugation, followed by the antibody number and size suffix.